Turkeys are the largest domesticated bird. Particularly widespread on the territory of Russia of the canadian breed. Her weight and height are very tender and tasty meat. Turkey canadian rocks are the home of broiler turkeys. They are derived from the white chested turkeys in Canada. In Russia birds of this breed were imported relatively recently. By the way, these turkeys are really loving the warm climate. That is why they practically do not breed in the Northern regions where very cold winters. With regard to the appearance of individuals of the canadian breed, they have a fairly compact size, white plumage color and broad chest. Breeders usually get from these turkeys a large amount of white meat. Particularly intense growth in canadian turkeys observed for three months and then the process slows down somewhat. Also birds can boast of very beautiful and smooth tail, which allows the carcasses to be very marketable. Turkeys canadian breed to eight weeks of life manage to work up enough weight. So to score them for meat at this age. The weight of an adult Turkey can reach 30 kg. But the weight Turkey is usually no more than 15 lbs. because Of this, there are often difficulties in reproduction. Often practiced artificial insemination. Usually Chicks only acquire from professional breeders. Birds of this breed, there is one undeniable advantage – they start laying eggs fairly early and bring a large number of eggs. However, there have canadian turkeys and disadvantages. For example, they are too demanding on the stern. It must be varied and enriched with vitamins and minerals. You need to ensure that turkeys have always had a lot of food. Birds of this breed are very poorly tolerate the lack of power. 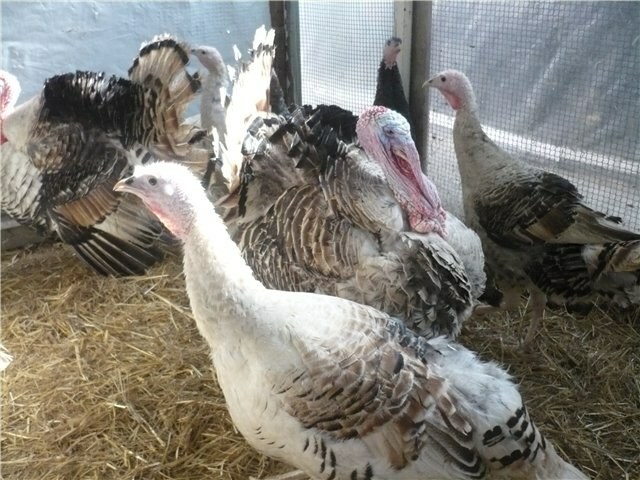 How to care for canadian turkeys? The canadian breeding turkeys arrangement requires a fairly large house. It must be supported optimal temperature of 22 to 25C heat. Need to pay much attention to prophylactic prevention of disease, because birds of this breed are very sensitive to intestinal and infectious diseases. As for feeding, for the canadian turkeys are very healthy and balanced feed. And the Chicks can be given steamed buckwheat and various dairy products (cheese, yogurt), and add a hard-boiled egg. In the diet must necessarily include meat and bone meal. Very important in the process of growing canadian turkeys is the use of liquid. You need to monitor the cleanliness of the water and maintaining it at room temperature. But from getting wet Chicks must be kept secure, as dampness they can not tolerate.